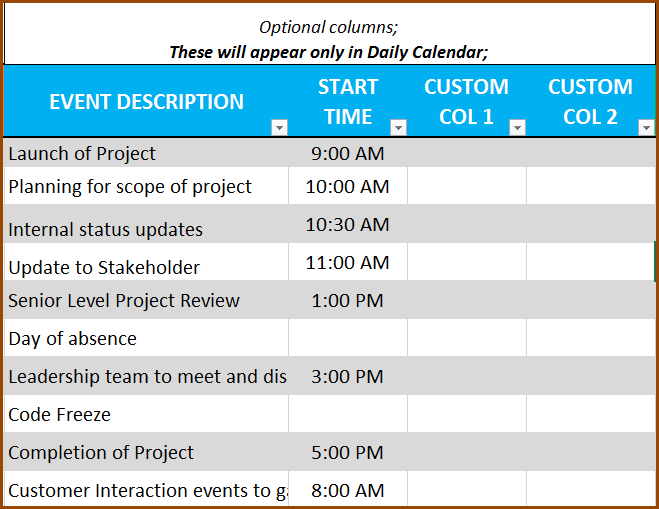 This post will contain information related to the support of Event Calendar Maker Excel Template v3. v3 was published in December 2015. Please read further below for the list of articles. How to add event location and time to calendar? How to create payroll calendars? How to design your own calendar layout? The template has 9 worksheets and you can just click on the worksheet name (tab) and go to a specific sheet. In the Home worksheet, you will get started with entering some basic information about the Calendar. Enter a name for your calendar. This will be displayed on the calendar. You can enter your own (up to 300) events that will be displayed on the calendar. You can also categorize them under (up to) 12 event types. First, you will enter the names for the Event Type. You can choose a colour for each event type from the list of 15 pre-chosen colours. The color next to the Event type will be used to highlight the corresponding dates on the calendar. In the ‘Events’ worksheet, you will enter your events. You can enter up to 300 active events and these events will be highlighted on the calendar. STEP 2A. Enter Event Name, Event Type, Event Start Date and Event End Date. 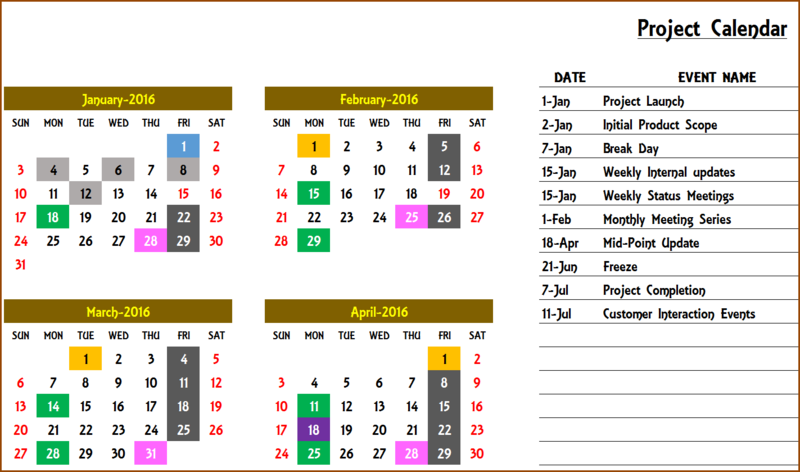 By choosing the event type, the dates will be color-coded on the calendar according to what you chose in Step 1C. If the Event Type is blank or not one of the Event Types listed in the 1C, the event will not be highlighted with colour on the calendars. If you have multiple events on the same day, you will enter them separately. You can enter events in any order. They do not have to be in chronological order. Leave the Event End Date blank if it’s a One-time event. Choose Frequency Type from the 12 options. Please watch the demo video where all frequency types are explained and shown. Choose the Weekdays you would like to allow for each event. Enter 1 in the MO column, if you would like the event to happen on Mondays. These fields are not applicable for One-time and Every Nth day events. N is applicable for 7 of the 12 frequency types. They are provided below with examples. Choose ‘Skip’ if you would like to not display the event occurrence on non-business days (weekends and holidays). If left blank, the event occurrence on non-business days will be coloured with the event type colour. 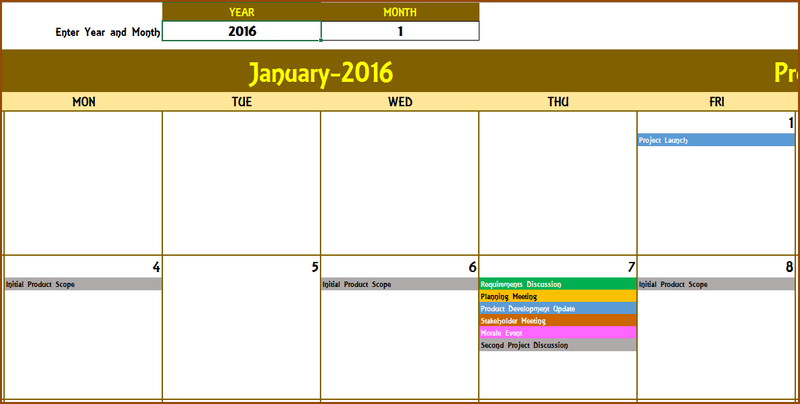 When more than one event happens on a day, Higher Priority event’s color will be chosen for calendar display. Lower Number means higher priority. • If you don’t enter any priority, it is equivalent to zero (Zero has higher priority than any positive number). • If two events have the same priority, then the events will be prioritized based on the order in which you entered them in the Events table. Enter N in ACTIVE? column if you would like the event to be not displayed on calendar. There are optional columns for Event Description and Start Time. There are also two custom columns that you can rename and use. These four columns will only appear in Daily calendar. There are 7 calendar designs to choose from. All the 7 calendars are automatically generated based on your inputs in STEP 1 and STEP 2. You can print the calendars easily as they are already set up to be printed. You can also export calendars to PDF documents for sharing. Thank you for a great template. I am wondering if there is a way to do an event every 2 months on the 3rd day of the month. And also is it possible to delete one date of a monthly event? I have a few monthly meetings that fall on holidays so the client will not have meeting but will be in following month. Thanks for sharing positive feedback. We have a support page for this template at https://indzara.com/2015/12/event-calendar-maker-excel-template-v3-support/. Please review it to change the value of N, which in turn calculates the frequency of the events. Also, we have explained how to set the priority of events. Hi indzara! Thank you for the amazing template. Just wondering how could I make it block out all the dates for the events that span across multiple days? Many thanks. You can mention the start date and the end date for an event that spans over a couple of days at the events tab. Also, mention the weekends so that calendar is updated accordingly.